ANOTHER SHOW OF SHAMELESS PROMOTION, DOPE MUSIC, DRODIAN, DIE4RADIO, AND SHUT EM DOWN HOMAGE. OH YEA, A FEATURED INTERVIEW FROM AN ARTIST THAT YOU WILL SEE ALL OVER WHEN THE WORLD STOPS LIKING BS…AND STARTS PAYING ATTENTION TO HIP HOP. I’M TALKING ABOUT “TWOO MUCH” AKA NICK FRESHHH. 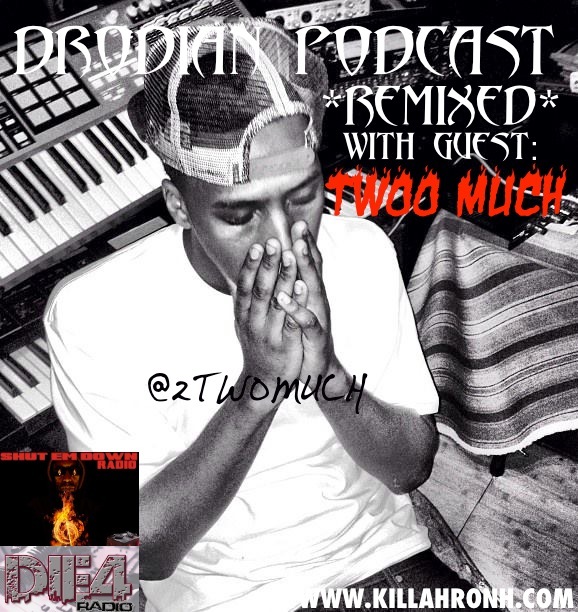 IF YOU’RE DRIVING, SIT BACK..LISTEN, AND PREPARE TO BE AT YOUR DESTINATION BEFORE YOU KNOW IT…I’M KILLAHRONH, AND THIS IS THE DRODIAN PODCAST.